Samsung Star Nano 3G is 2.6 inch touchscreen 3G enabled mobile phone, that comes loaded with social networking apps for SNS like Facebook, Myspace, YouTube, etc.It also comes preloaded with GTalk, AIM, Palringo Chat for instant messaging.The phone comes with 35MB internal memory and is expandable upto 16GB and has a 1.3 megapixel camera,FM radio and Mobile Tracker.It can store up to 2000 contacts on its phonebook and upto 800 SMS.New apps can also be downloaded for free from Samsung Apps. 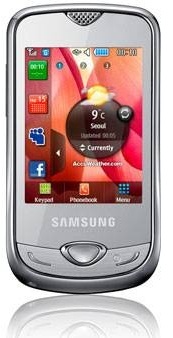 The Samsung Star Nano 3G phone is priced just Rs. 7,320 and is bundled with 2GB memory card, stylus pen and leather pouch.